At a meeting Thursday evening I was asked why MCEDC (Marshall County Economic Development Corporation) is included in the Affordable Housing Task Force for Culver and I didn’t give you the best answer. Let me see if I can do better here. One of the things that came from the MCEDC BEAR meetings was the need for more good employees. In the last six months the unemployment rate in Marshall County has dropped another percentage point to 4.5%. (Doug Anspach, former PEDC Director, used to say that at 4% unemployment everyone that is able and willing to work is working.) Since no one is stepping up to address this employment issue, we have added “Workforce Development” as one of our four main action items in the MCEDC strategic plan. Housing is just one of the issues that needs to be addressed under workforce development. 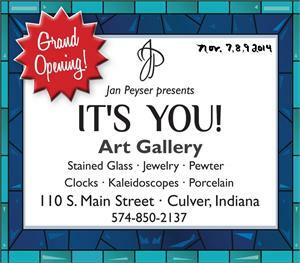 The Culver Chamber of Commerce is having a ribbon cutting for the new It’s You! Art Gallery today at noon. Please consider coming to show support and welcome this new business to the community! Through my position on the MCEDC (Marshall County Economic Development Corporation) board, I have met Regina Emberton, President and CEO of the Michiana Partnership. Michiana Partnership is a regional organization that includes Marshall County and they are involved with marketing our area. She shared the forum information below regarding IEDC‘s (Indiana Economic Development Corporation) promotion of their Regional Cities Initiative. It’s not something I can attend, but I thought it was worth sharing here. I truly believe the old adage that “A Rising Tide Lifts All Boats”. We need to work together as a region to grow our economy and our fate is at least peripherally tied to the success of South Bend/Mishawaka. The Indiana Economic Development Corporation (IEDC) is holding regional forums across the state to discuss the governor’s Regional Cities Initiative and key findings from the study that benchmarks peer cities around the nation. We are relying on you as leaders in your communities to invite others who should also attend. You can do so by simply forwarding this invitation. The types of individuals in your community who may wish to attend could include school superintendents, college/university leaders, Rotary and other volunteer groups, chambers of commerce and other business groups, elected officials, community foundations, religious leaders, arts organizations, economic development professionals, and other civic or business leaders. All are welcome to this meeting. Please visit www.indianaregionalcities.com to learn more about the Regional Cities Initiative. 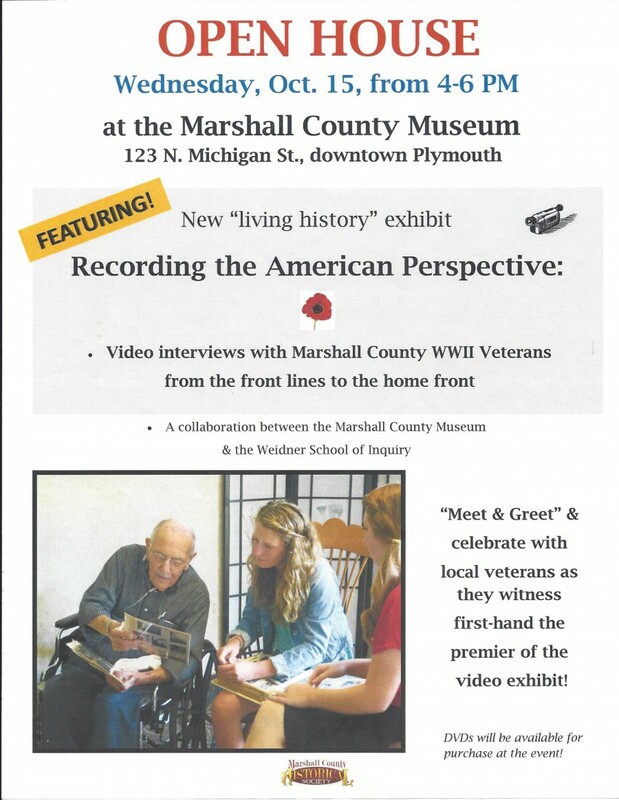 A while back I wrote about my grandfather being interviewed by students from the Weidner School of Inquiry regarding his service in World War II. The exhibit at the Marshall County Museum that resulted from this is open. This is a flyer for the Open House a couple of weeks ago. That’s my grandfather as the poster boy for the event! Unfortunately my grandfather was recovering from double pneumonia at the time and didn’t get to attend. Stop by and check it out. My grandfather turned 100 this year. There are not many WWII veterans still around. We need to learn from them and remember them. I visited a client last week who was asking about a portion of his home that had a sagging ridge line. The roof is also the style that has two different roof slopes along the rafters. It is an older home so my first thought was that it was not built using trusses and the rafters and or ridge beam was undersized. I asked to go inside to see what internal effect this was having and was somewhat surprised to find a room with a vaulted ceiling which did not follow the roof line at all! While this is not unusual and is often accomplished in current designs using a scissor truss, the age of the structure and the lack of a transfer of the exterior failure to the interior ceiling indicated this was not the case. One of the advantages of a truss roof is that the roof load is transferred directly down on the perimeter walls. When properly designed, the loads in a rafter roof design transfer the loads down as well, but when the ridge beam is undersized, it will sag causing the rafters to exert lateral pressure on the perimeter walls. There weren’t any particular indications of this occurring. And then there is the puzzle of the vaulted ceiling. According the the owner, it was a later addition, so was a new ridge beam and rafter system put in below the roof to support the ceiling? Is the ceiling hanging from the roof beam and rafters? (Which would add to the stress on the roof.) Unfortunately I had to admit that my X-ray vision was not up to the task of determining the internal workings of the roof and ceiling situation. The failing roof is hidden and not corrected. Out of sight, out of mind is not a solution. The underlying failing roof is now under additional loading, potentially increasing the problem. While the metal roof can at times reduce the potential snow load since snow won’t stick to the metal like it does to shingles, it is still an increase of the day to day material load on the underlying structure. Often there is rot and deterioration associated with the sagging roof. Under the additional roof, it may continue to deteriorate unobserved potentially leading to failure. But back to my client’s problem. I had to tell him that there wasn’t a quick fix. Due to the hidden problems, some selective demolition would be needed to determine a solution. That’s not generally something a client likes to hear, but it is the right thing to do. Source: Sagging Ridge image borrowed from Prugar Consulting,Inc.